Event Track / Boston Calling / Planning Guides / Are Boston Calling VIP or Platinum Passes Worth It? One of the most common questions with any music festival is if the VIP or upgraded passes are worth it. Boston Calling is no exception. Obviously a lot of this comes down to personal preference, but I will do my best to lay out the pros and cons of each pass and whether or not I think they are worth it. Let’s start with the different options at Boston Calling. Boston Calling is moving in the trend of what a lot of festivals are doing: three levels of passes. The different passes are general admission, VIP and Platinum. Each pass obviously comes with upgrades but you will also pay for it. Note that these are the prices on the day the lineup came out for Boston Calling 2018. Prices after the first day go up slightly ($10 for GA, $50 for VIP, etc). As always with music festivals, the earlier you buy the more you save. What Perks Do You Get With Boston Calling Passes? Access to all the bands on the lineup and all three outdoor music stages. Essentially it gets you into everything besides special VIP areas.You can see all the bands, see the films and comedians, eat anywhere in the GA area, etc. Are Boston Calling Platinum Passes worth it? Priority Entrance: If you went to Boston Calling in 2017 you know the lines were bad…like really, really bad. The priority entrance given to Platinum (and VIP) pass holders is a nice perk to alleviate this. This is doubly nice if you are the type who goes to festivals a bit late when the lines are peaking. If you go to festivals early the lines won’t be bad, but if you roll in around 1 p.m. to 2 p.m. then this is a big perk for you. Elevated Viewing Areas: This is what you are really paying for with Platinum passes. This allows you to secure a great spot. In the map above you can see the large, yellow areas reserved for Platinum guests. It may seem like it's far away, but it's still a great view of the stage, especially because you are elevated. It's a huge perk for not only the view, but the lack of the crowd. Boston Calling GA area can be a madhouse, especially when a headliner is coming on. With a Platinum pass you are guaranteed a great view without needing to camp out all day - just show up right before the show and enjoy your view. Food/Booze With Specialty Pricing: This may seem a bit vague, but it actually is a really good deal. Beers are just $2/3 depending on what you want and there is essentially always free food. I was a little skeptical of this perk when they listed it, but it actually is quite good. Complementary Non-alcohol Drinks / Gift Bag / Free Parking: These are secondary perks so let’s just group them together. If you are driving to Boston Calling the parking is located in a great spot near the festival. If you would just take the train, which we suggest, this won’t do much for you. The gift bag is nice and includes the tote, a pin and some other goodies. If you like this type of stuff it’s a nice little add-on. Finally there will be free water, sodas, coffee and more in the platinum area – also very nice. Golf Cart Transportation: Not necessarily listed on the perks list for Boston Calling Platinum, but they do have golf carts to chauffeur you around the festival should you wish. It definitely makes you feel like a platinum guest! So is Platinum Worth it? We say yes if you can afford it. Keep in mind you can also use the payment plan for Boston Calling, which makes it a lot more manageable. If you like the lineup a lot ofr Boston Calling I would say the platinum is worthwhile – there will be plenty of free food, really cheap drinks ($2/3) and finally the elevated views are pretty great. On top of all of this you will have no issue with crowds all weekend. If you can afford it the Platinum passes are a great option with a lot of nice perks. 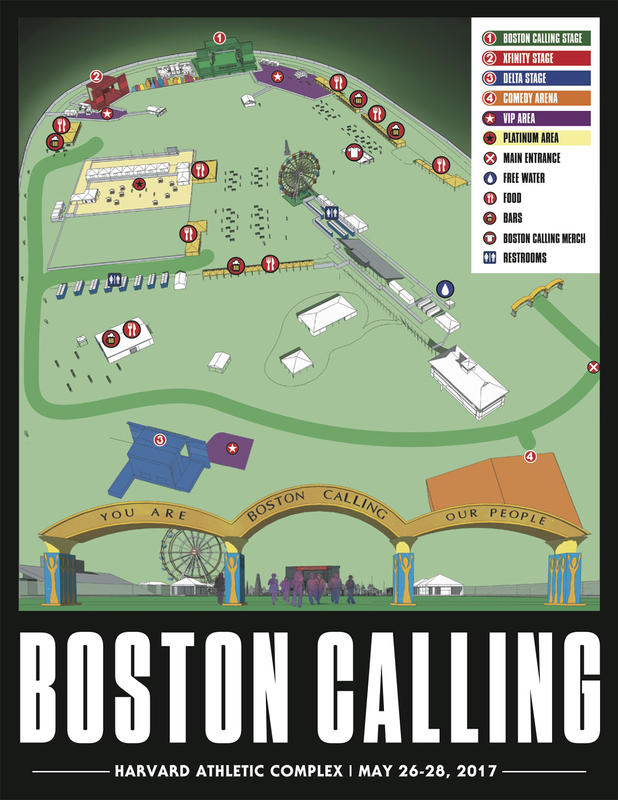 Fast, priority entrance into Boston Calling: The same perk as Platinum – it will give you a quick access into Boston Calling, allowing you to avoid the massive lines of the GA admission area. Premium viewing areas at every stage: The VIP viewing areas are good (see the purple areas above on the map), but not as good as Platinum as they are not elevated. The VIP viewing area essentially comes down to this: the good is you are close to the stage and the crowds are nowhere near as bad as the GA. The bad is the view is to the side of the stage. If you are OK with this view to the side then the VIP is still great. A lot of this comes down to how much you dislike crowds, as the real perk is you won’t be sandwiched in like a sardine for headliners. Basically if you have any problems, questions or need you get a special person to contact with your issues. I personally don’t care about this at all, but if you enjoy this sort of thing it’s there. Exclusive air-conditioned VIP area with special drink and food options: This is the VIP area with comfortable seating, bars, air conditioning and other perks to make you comfortable. It’s not the best area for viewing music, but it is nice to relax and recharge for the rest of your day at Boston Calling. It’s pretty standard for VIP at music festivals: some perks, but you honestly won’t spend much time here unless you are the type who goes to music festivals for everything besides the music. So is VIP worth it? Personally I think VIP is only worth it if you can snag it during presale, when it is much cheaper. I can stomach VIP for under $300 given the lineup, I can’t justify it for $500. In year’s past Boston Calling included free food for VIP but they did away with that in 2017, which is unfortunate. The priority entrance into the festival is nice, and some of the other perks are nice to haves, but they don’t justify a $500 price tag for me unless you really just hate crowds. Snag them during the presale or not at all in my book. Upgraded music festivals really come down to your budget. Boston Calling makes it nice by including the VIP and Platinum passes under the payment plan, so you can make it more manageable that way. That said, I personally like the Platinum pass if you can afford it. I’d only go with VIP if you can get it at a steep discount on presale.